Love Wins, the controversial bestselling book by Rob Bell, attempted to answer this question, which troubles nonbelievers and believers alike. Because Bell challenged traditional, orthodox Christian views of hell and the afterlife, many were left asking: "Are his ideas as reliable and hopeful as they sound? What does the Bible really say about hell?" 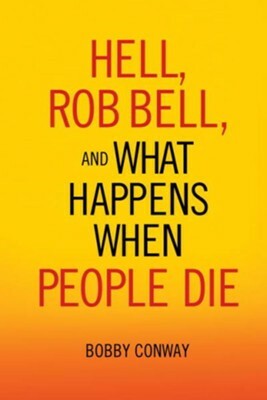 In Hell, Rob Bell, and What Happens When People Die, Bobby Conway, a recognized authority on Christian apologetics, brings clarity to these serious life and death issues. "Love really does win," according to Conway, "but its through the death, burial, and resurrection of Jesus Christ." Based on a thorough examination of Scripture and a careful analysis of Rob Bells propositions, Conway delivers a compelling and concise explanation of hell, the afterlife, and a loving God. The conclusion: Everyone who believes and trusts in Christ has no need to fear the anguish of hell but can confidently anticipate the eternal joy of heaven. Bobby Conway is the lead pastor of Life Fellowship Church in Charlotte, North Carolina, and the founder and host of the web-ministry the "One Minute Apologist" (www.youtube.com/oneminuteapologist). Bobbys advanced degrees in theology and apologetics (ThM, Dallas Seminary and DMin, Southern Evangelical Seminary) equip him to provide insightful answers on issues of biblical faith. Bobby and his wife, Heather, are the parents of two children, Dawson and Haley. "Bell on hell doesnt ring the bell. Rather, Bobby Conway shows the right way. Jesus is the only way, and He believed heaven was the narrow way. God is the loving way, but He cant force a rebel to go another way. It is more loving to allow them to go their own way. So, Gods love necessitates the truth about hell and tolerates the error of Bell." "In Love Wins, Rob Bell challenges the traditional Christian view of hell and who goes there. Unfortunately, Bells handling of the biblical texts is neither careful nor equitable. Readers who wish to be more informed will appreciate this critique by Bobby Conway, a trusted Christian apologist." "At a time when the truths of Scripture are ignored, revised, and openly denied by various leaders, the ministry of Bobby Conway is a breath of fresh air. With meticulous scholarship and excellence in presentation, he tackles tough subjects in ways that are understandable, relevant, and applicable to everyday life. Conway is doing the important work of standing up against the recent challenges to Christian orthodoxy (such as in his critique of Rob Bells denial of hell). With plain truth and no spin, Conway is introducing a new generation to true Christianity." "Hell has been a hot topic lately, and whether you believe in the reality of hell or not, this book deserves a fair hearing. Theres much pressure to abandon the reality of hell and embrace the idea that eventually everyone will be saved. But as Bobby Conway points out, this was not the view held by Jesus. We may not like hell, but can we dismiss something Jesus warned people about? Conway says no, and I agree." I'm the author/artist and I want to review Hell, Rob Bell, and What Happens When People Die - eBook.